The Queen visited the National Stud in Kildare next week - but Royal sources have ruled out a further visit to the Curragh next month. THE HOPES OF racing officials that Queen Elizabeth may have been set to return to Ireland next month – within weeks of her successful State Visit - have been dashed this morning by royal insiders. Her Majesty’s horse Carlton House is an entrant for next month’s Dubai Duty Free Irish Derby on 22 June – and is likely to feature on the final race card, depending on its performance at the Epsom Derby earlier in June. The three-year-old is the bookies’ 6/4 favourite to win at Epsom on 4 June – and depending on its performance, could take up a spot in the Irish equivalent at the Curragh just over three weeks later. But irrespective of whether the promising colt travels to Ireland for 22 June, its more famous owner will not be joining it – because of a previous engagement that Buckingham Palace is loathe to change. 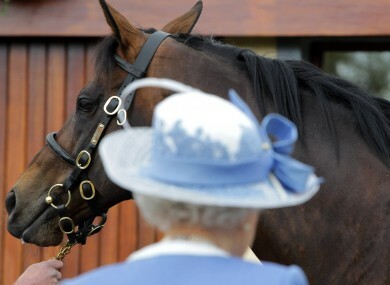 Industry sources had speculated that the success of last week’s State Visit, and the possibility of her horse taking victory in the Derby, might encourage the Queen to visit the racecourse and watch the race in person. This morning Paul Hensey, the general manager at the Co Kildare racecourse, had said the Irish Derby would be a “very obvious target” for Carlton House – and that the visit of the Queen to the Curragh was a “distinct possibility”. But the Queen and Prince Philip already have engagements for 22 June in Northumberland in northern England, and Buckingham Palace is reluctant to cancel or postpone any public engagements for which the Queen’s hosts have already begun preparing. The Queen’s private engagements and appointments – including most of her trips to racing meetings – are not handled or discussed by the Palace, which had no official comment on the speculation. But sources said that the planned visit to Northumberland would include a series of afternoon engagements, ruling out all possibility of the Queen travelling to Ireland and back. A follow-up visit could have further strengthened the diplomatic ties between Britain and Ireland following last week’s State Visit, which was hailed as a diplomatic triumph by commentators and media on both sides of the Irish Sea. Email “Hopes of Queen's visit to Curragh dashed by Palace”. Feedback on “Hopes of Queen's visit to Curragh dashed by Palace”.